Akt was immunoprecipitated from untreated or LY294002 treated Jurkat cell extracts, using Akt (5G3) Mouse mAb (Biotinylated). This immunocomplex was then pulled down using streptavidin beads. 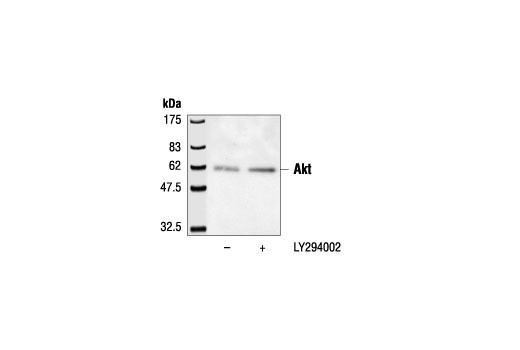 Western blotting was performed with Akt Antibody #9272. Akt (5G3) Mouse mAb (Biotinylated) detects endogenous levels of Akt. This antibody does not cross-react with other related proteins. The antibody is prepared by biotinylation via its primary amines. Biotinylated antibodies are useful for the detection or purification of Akt using avidin-biotin binding.